She gazed out of the window of the coach, smiling at the scenery and saying, "wow!" in her head. 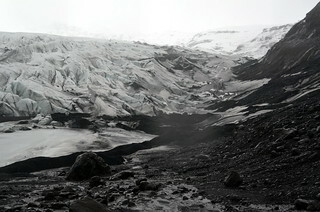 She walked through the pouring rain to stare at the glacier, amongst the ice and snow and lava. On the way back, she noticed bit of melting ice on the hillside and when she stood still and watched, she could see what almost looked like tiny black creatures wriggling underneath the ice. It seemed magical to her at that moment, the melting of ice. 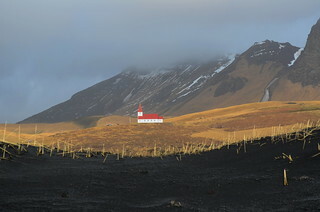 The next sight was Iceland's most southern village - Vík í Mýrdal. The rain had stopped and the sun shone then, as she wandered towards the sea. She sat on the beach with black sand and ate her sandwiches, and watched the tremendous roaring waves. The distant waves looked like clouds, and she thought about how there was no land mass between where she was and Antarctica. 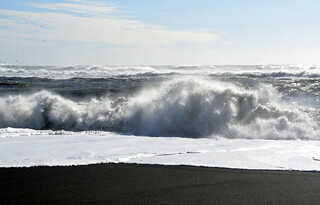 Then she visited Reynisfjara beach and it was so windy that she thought maybe she would start to fly. The cave had a ceiling made of jagged rocks, so she did not stay inside for long. 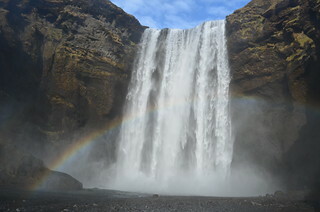 Next, she climbed many steps to get to the top of the waterfall, Skógafoss Waterfall, and watched the water rushing down. At the bottom of the waterfall was a rainbow and she felt amazed at the sight. 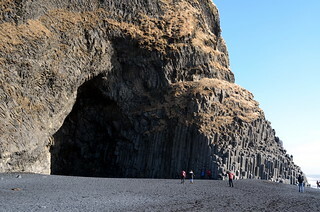 Basalt formations with their polygonal are amazing. Tiny rime jotuns sounds about right!